Fuerte Conil in Conil de la Frontera, Hotels in Conil. 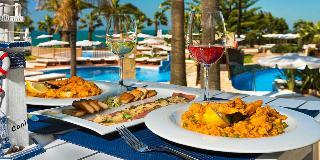 Hotels & Accommodation in Conil de la Frontera. Opened in 1999, the hotel is designed in modern architecture and includes 469 rooms spread over 5 floors. Guests may make use of the foyer with 24-hour reception desk, a lift, a safe, currency exchange service and free Wifi access. Dining options include restaurants and further facilities include a café, bars, various shops, a hairdresser, a breakfast room and a TV room. A games room is offered for leisure options and conference facilities for business guests. Also on offer are laundry and room services as well as a bicycle hire facility. There is also a kids' club and playground for younger guests. Those arriving by car may make use of the hotel parking facilities for an extra charge. Bathroom, Bath, Hairdryer, Direct dial telephone (Not included in price), TV, Satellite / cable TV, Internet access, Minibar (Not included in price), Double bed, Central air-conditioned, Central heating, Safe (Not included in price), Balcony, Terrace. Air-conditioned in common areas, Reception area, 24h check-in, 24h. Reception, Safe, Money Exchange, Lift-s, Cafe, Newspaper stand, Shop-s, Hairdresser, Bar-s, Conference room, Game room, TV room, Breakfast room, Dining room, Restaurant -s, Restaurant - Air-conditioned, Restaurant - non-smoking area, High chairs, Mobile phone network, Public Internet, WLAN access point, Room service (Not included in price), Laundry service, Launderette (Not included in price), Wheelchair accessible, Bicycle rental (Not included in price), Car park (Not included in price), Garage (Not included in price), Mini club, Playground, Number of pools, Indoor pool, Outdoor pool, Heated pool, Children's pool, Sun loungers, Parasols, Whirlpool, Sauna, Sunbathing Terrace, Steam bath (Not included in price), Massage (Not included in price), Special SPA packages (Not included in price), Gym. Bed and breakfast, Half board, Breakfast buffet, Lunch à la carte, Dinner buffet.